A survey conducted among top UK event agencies by C & IT shows positive outlook for incentive travel. The results, published in July 2017 show positive growth specifically for B2B incentives in 2017, with growing popularity of long-haul destinations, including South America and Asia. Additionally, according to Meeting Professionals International (MPI) quarterly Meetings Outlook report published in May 2017, meeting budgets are raising, giving more creative freedom to planners to pitch for favourite long haul destinations. Given the positive outlook for long haul incentive travel and good budgets, I take this opportunity to present you with a destination you might well consider for your next corporate event – Thavorn Hotels & Resorts in Phuket, Thailand. The resort has two properties, located in proximity from each other and about 30 minutes by car from Phuket International Airport. Just recently both properties have been renovated to improve their MICE facilities, increase meeting space and launched a dedicated MICE website. Both resorts are five star properties. The Thavorn Beach Village Resort & Spa has access to the private Nakalay beach and Thavorn Palm Beach Resort is located on the prime beachfront spot on Karon beach and if necessary both can be used jointly for an event. Both resorts together have 383 guest rooms to accommodate your delegates, with Thavorn Palm Beach Resort offering a larger event space, for up to 460 guests, and Thavorn Beach Village Resort & Spa for up to 200 guests. Phuket is a popular leisure destination, therefore it’s recommended to choose the low season for MICE. These are the months between April – October. Ideal duration for business stay is about 2 – 3 nights, but of course your delegates will be able to prolong their stay and enjoy all resort facilities and explore the area. Now let’s look at each property more closely. The Thavorn Beach Village Resort & Spa is nearby the bustling Patong touristic hub, where delegates can experience the vibrant nightlife, explore the vast shopping opportunities and exciting leisure attractions, while at the same time be able to retreat for business and enjoy the privacy of Kamala beach and The Thavorn Beach Village Resort & Spa, thus allowing the delegates to enjoy the best of two worlds. With total of 185 guest rooms, the resorts boast its prime location on Nakalay Beach where the guests can use the beach privately for the purpose of their event or relax between meetings with a massage or a cocktail on the beach. Furthermore, the resort has its own free-form swimming pool, resembling a natural oasis to give guests a feeling of swimming in the ocean. It’s a wonderful location for delegates to take a break between meetings or for organisers to use this space for a dining function, where delegates can enjoy the cascading waterfalls, bridges, Thai sculptures, exotic plants and beautiful flowers. The hillside cable car is another attraction to offer without leaving the hotel promises. To access the rooms at the Kamala luxury resort, guest will have to take the funicular railway and can appreciate the beautiful forest scenery. The Nakalay Ballroom at The Thavorn Beach Village Resort & Spa can accommodate up to 200 delegates and offers natural daylight overlooking the orchid gardens. This space is flexible and versatile and can be separated into two rooms, Nakalay Room A and B, for smaller functions. The Nakalay Room A will be able to accommodate 120 people and Nakalay Room B up to 80 people. Both rooms offer direct access to the private beach. The bigger of the two with 198 guest rooms, The Thavorn Palm Beach Resort is located on a prime Karon beachfront location. The white sandy beach is a top spot for incentive activities such as jet skis, parasailing or beach volleyball. Thanks to being west – facing, at night that’s a prime location for watching the sunset from one of the on-site restaurants, such as Old Siam or Ciao Bistro, a WOW element to add to any evening function. If delegates don’t have time to leave hotel promises, they can take advantage of any of the four pools. During the day or evening, they can book the area for poolside dining and enjoy the relaxing outdoor ambiance. The on-site botanical gardens can also add a WOW factor to any event without leaving the promises. The garden offers a unique ambiance to stimulate all the five senses with the tropical fauna and flora. This little paradise is home to exotic species, plants and flowers and valuable specialties trees collected by the owner herself. Delegates will see diverse range of animals, including birds, butterflies, dragonflies and frogs as well as roosters, parrots and a rabbit roaming about the grounds and the tropical orchid garden is blooming all year round. 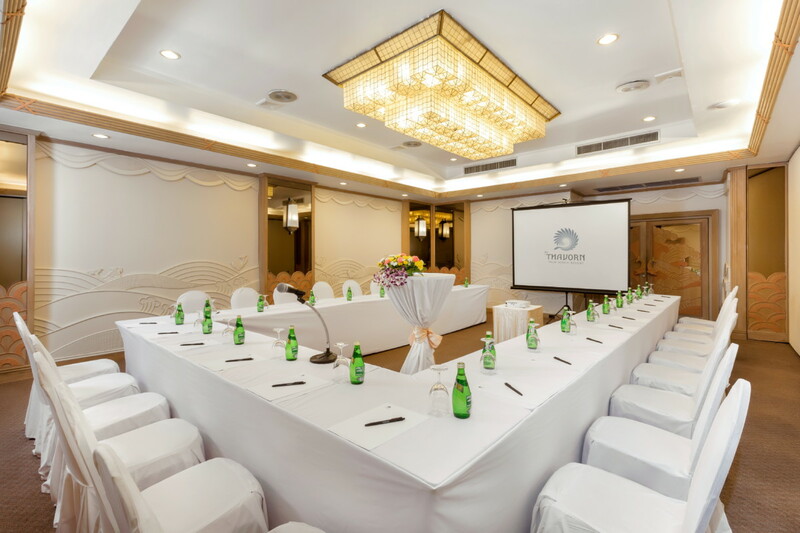 The Thavorn Palm Beach Resort has two versatile event spaces that are divisible into five smaller meeting rooms. The Royal Palm Banquet Hall is the biggest room suitable for up to 460 guests. The vasatile Royal Palm Banquet Hall can be divided into two smaller rooms, Royal Palm Hall A and B, with maximum capacity of each for up to 230 delegates. The Palm Flower is suitable for up to 160 people and can be split into three, Palm Flower A, B and C, with maximum capacity of each for up to 55 delegates. Event organisers can use the catering facilities of both resorts and choose among the various cuisines and dining styles. At The Windsong restaurant breakfast is served daily and for lunch and dinner it offers À La Carte, a mix of Thai and International cuisines. The Ciao Bistro is ranked among the finest Italian restaurants on Karon beach and the Old Siam authentic Thai restaurant is popular for traditional Thai cuisine. The two bars, Blue Heaven Pool Bar and Chaba Swimup Bar are ideal for drinks receptions, coffee breaks and refreshments. When it’s a multiple day event, it will be recommended to offer the delegates variety of dining options, and there are multiple to choose from if you want the food to be served in the conference room. These include special Southern Thailand food set, Western set lunch, Thai buffet, international buffet, seafood BBQ buffet and Chinese set. Coffee breaks and cocktail receptions are also possible. Given the positive outlook for long haul travel for B2B incentives, as well as raising meeting budgets, planners can now add long haul destinations back to their pitch list. Being still conscious of event budget, Thavorn Hotels & Resorts offers luxury accommodation and great service for affordable price, helping planners to make a strong case study for a long haul corporate incentive.